You are viewing our Past Program Information. Meeting Sponsored by: Executive Arrangements Inc. Session Description: Please join us on Thursday, March 15, 2018 to hear Ashley Basile Oeken of Engage! 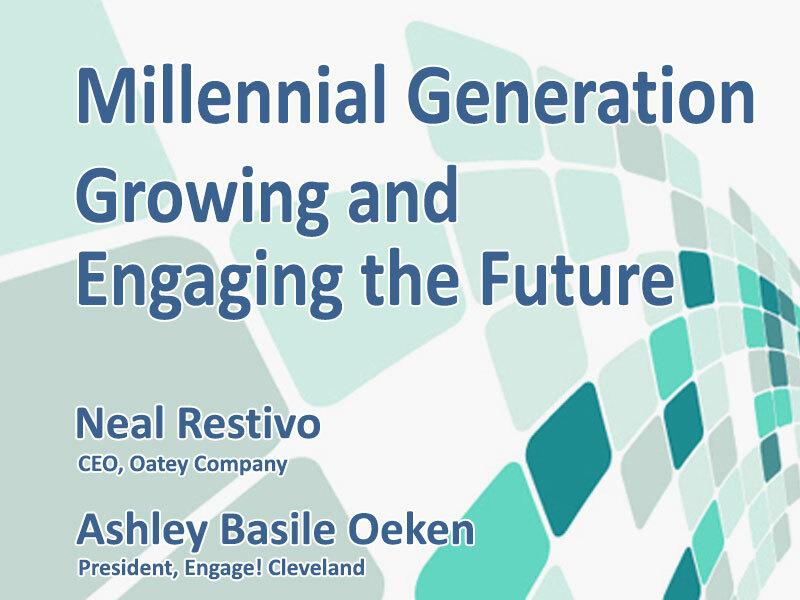 Cleveland and Neal Restivo of Oatey Corporation discuss the Millennial Generation – Growing and Engaging the Future. Millennials, Gen Z and the Gen Nexters: when engaging these employees where do you begin? Research shows that three out of four Millennials first choose a place to live and then look for a job. Meaning we need to elevate the community and our companies at the same time, finding a good intersection. Millennials need to feel welcomed, valued and supported in their positions. When companies make an effort to actively engage these employees, it goes a long way to assist with the attraction, engagement and retention of this generation and serves as a double win for both employees and the employer. Learn some of the newest data about the next generation in Northeast Ohio as well as strategies to implement in your own companies to attract and retain the best and brightest. NOTE: This program has been submitted for review to HRCI and SHRM for recertification credits. NOTE: When process payment online, your credit card statement will show a charge from Snazzo Productions (MightECart). The program Millennial Generation – Growing and Engaging the Future, has companion documents available for download.